From gravity bongs to blueberry blunt wraps and, of course, brownies, industrious stoners have been tinkering with new ways to get high since time immemorial. Now they’re adding cocktails to that mellowed-out list. With the decline of marijuana prohibition, there is an increasing array of intriguing DIY and pre-packaged options available. Vodka is the overwhelming favorite for infusing because it’s neutral profile makes a great canvas for anything you care to add. Check the wild range of flavors available on any store shelf. But what’s the fun in that? 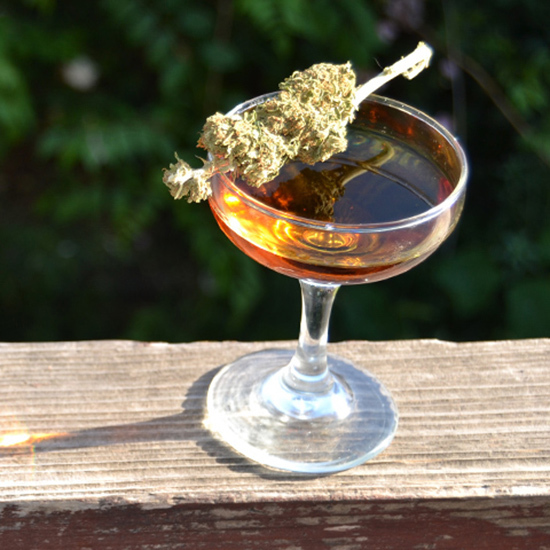 Curious to see how weed would play with whiskey, I whipped up a potent batch of Manhattans with weed-infused rye whiskey just in time to enjoy the afternoon sun. (I used Bulleit Rye.) This, um, potent recipe is highly recommended for those of you with no important evening plans. Eager for more potent dranks? Try bottled lemon ginger cannabis soda in a Moscow Mule, a lemonade vodka infusion for summer sipping or a homemade Sour Diesel simple syrup in, well, anything. Once you’ve settled on a green strain and spirit, remember this crucial step: decarboxylation. Your bud needs about an hour in the oven at 240-degrees Fahrenheit to transform the THCA into THC. If you skip this step, your infusion will taste nice—but that’s about all it will do. Learn all about the science behind this process at Marijuana Growers Headquarters. These portions are somewhat “choose your own adventure.” Obviously you can add more cannabis and infuse longer if you desire a more potent concoction (or less and shorter, for something more mild). Cut or grind your bud of choice and place it on a baking tray in the oven at 240-degrees Fahrenheit for 45 minutes. Pour the bottle of whiskey into a sealable one-liter jar, and add the baked cannabis. Agitate it lightly and let it sit, out of the sun, for 48 hours. Pour it through a cheesecloth and a strainer, making sure to squeeze any remaining liquid out of the cheesecloth.Matt Merkin is a writer and photographer currently based in Oakland, CA.